I've always been a risotto fan. Butternut Squash Sage Almond Risotto is a favorite savory entree - and mushroom risotto closely follows. 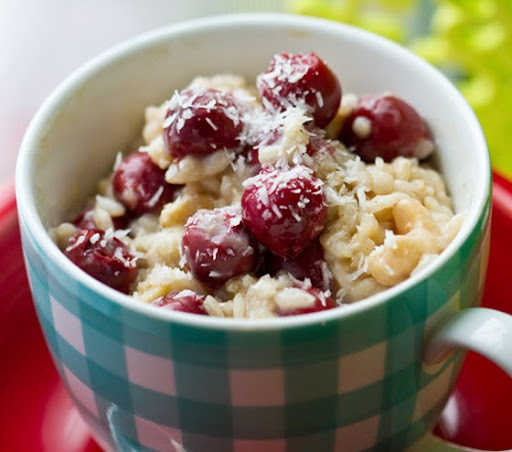 But what about using creamy-sweet arborio rice as the base for a breakfast risotto? I got the idea from a Joe Bastianich recipe - I tried it and was hooked. 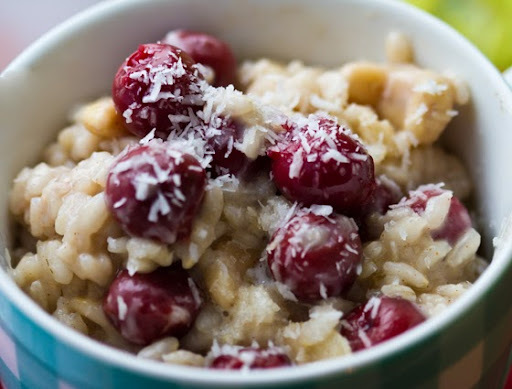 Breakfast risotto was added to my AM eats rotation. 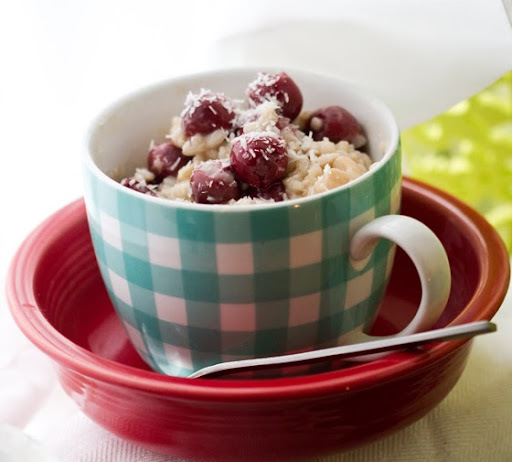 Blueberry Oatmeal - includes reasons to eat breakfast! 1. Add the water, salt, vanilla extract and rice to a large pot. Bring to a boil. Reduce heat, cover with a lid and allow to simmer for 15 minutes. 3. 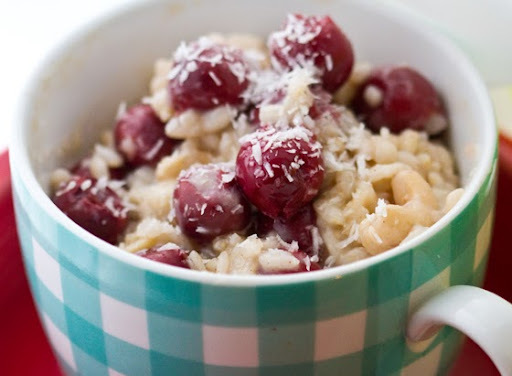 After the rice has absorbed most of the water you can add in the soy or almond milk and coconut milk. Continue stirring over medium heat and allow risotto to thicken. 4. 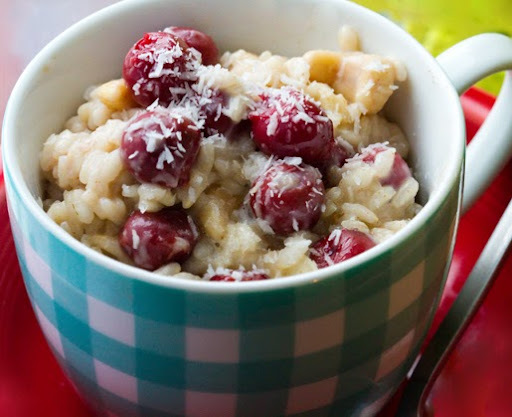 Fold in half of your cherries, the cashews, coconut flakes, sweetener and cinnamon. 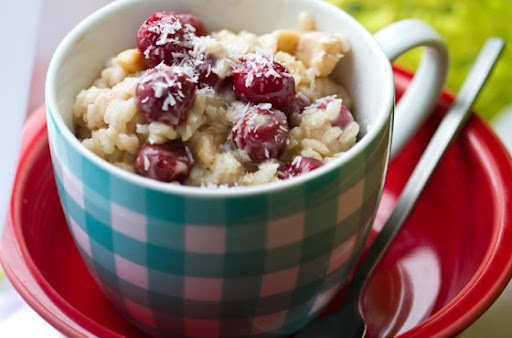 Do a taste test of your risotto. If it is tender and creamy - you may be ready to serve. You can always add in more liquid if you want an even more tender textured risotto. 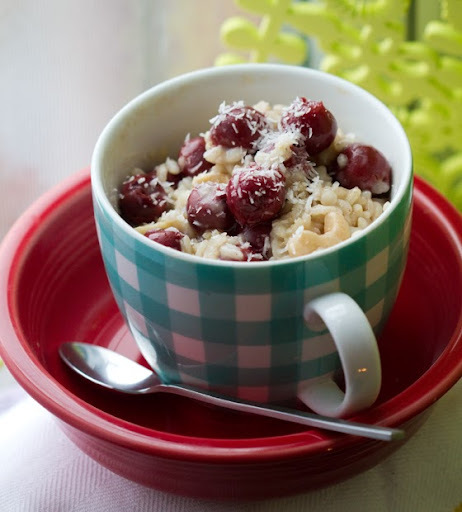 This cereal will be much softer than a dinner risotto. 5. 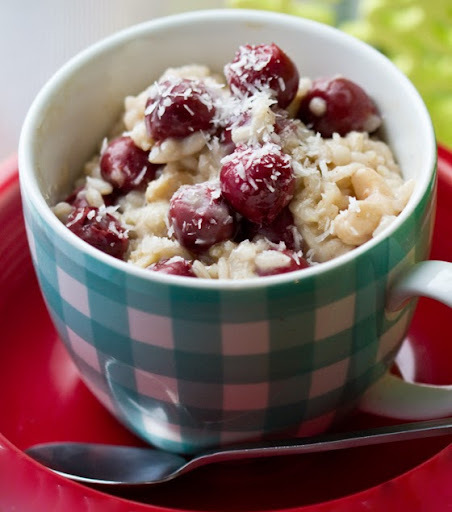 To serve, add the risotto to a bowl and top with coconut flakes, a few more cherries and a drizzle of coconut milk - or soy milk. Serve warm. Store the leftovers in the freezer or fridge and reheat in microwave or stove top.